Need: Trefoil outline (one per camper), markers/crayons (one per camper). Directions: Write each campers name, big, in the middle of the paper (one for each camper). Pass these around and have everyone write one nice compliment about everyone. Discuss what they see when they read them. (Optional: cut out the trefoil). 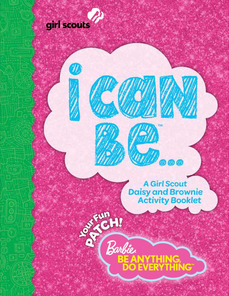 I first saw the Barbie I Can Be Patch featured on a councils blog and I thought it was really neat. At first it was hard to find anything about it, the requirements or the patch. bit, you can also find a fun game for the girls to play. The front has a patch that you can print and iron/glue/sew/staple onto the uniform, or you can go here to order a patch to be mailed to you. It's sent to you from a council in California. The end of the book has paper dolls that can be printed/cut out with 2 dolls and 4 sets of clothes. If you go here, you can find 13 more sets of printable clothes (although these need to be colored in). 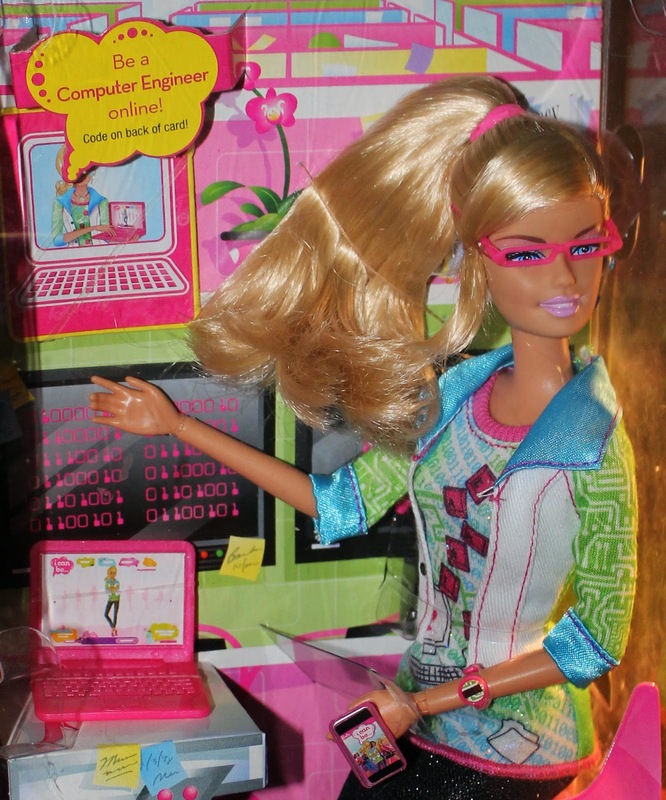 and this helped the girls see how a woman can be interested in a STEM career field. currently talking about the different roles people can play in their lives. As you can see in my blog picture, that's me with my favorite special teddy bear, Zeph. with us from other places, or made new ones at the places we visit. Zeph also has his own blog where he posts all of his adventures if you want to follow it. Did I mention that he also LOVES Girl Scout cookies? Need: 8-10 inch ribbons. enough for one for each girl. Fabric paint. Prep: Prepare in advance writing a descriptive word for each camper on the ribbon. These are 'awards' at the end of the session for something great about themselves that week. (One words are best but doesn't matter as long as it fits on the ribbon). Examples: Crafty, Creative, Energized, Camp Spirit. Can get creative with them: Best swimmer - Mermaid: Best at Archery - Bullseye/Katniss: Nature lover - Grasshopper; MVC (Most Valuable Camper); QBC (Quiet but Cool); Loves sports - Olympian; Social butterfly - Butterfly; Good at drama/skits - Star. Directions: Give these out as 'awards' at the end of the session at campfire, the last night at camp, or before they leave to go home. Need: Lots of beads of different colors, string for bracelets. Prep: Create a chard attributing different positive qualities to certain colors. (Examples: Exciting, Thoughtful, Leader, Outgoing, Patient, Kind, Cheerful, Generous, Creative, Understanding, Courageous, Enthusiastic, Sense of Humor, Helpful, Responsible, Good listener, Imaginative, Honest, Joyful, Friendly). 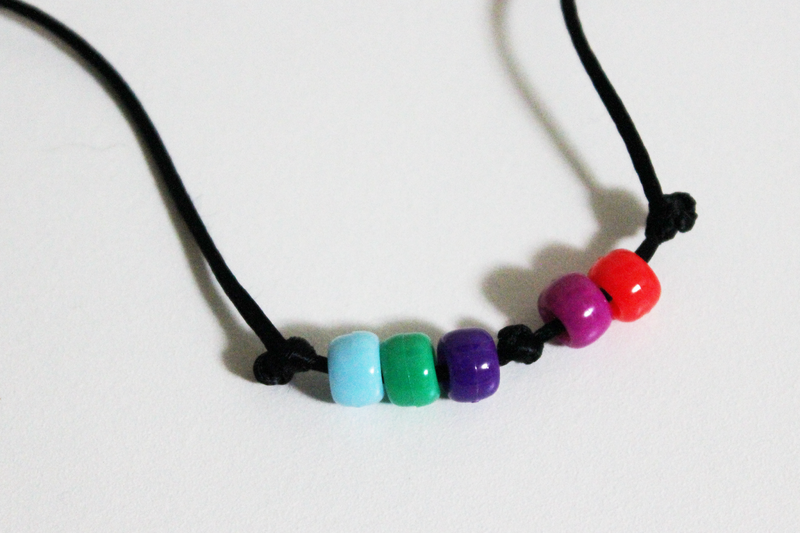 Directions: Each night have girls vote on what bead each person gets (several campers can get the same color) but only one bead per person. At the end of the session everyone will have a bracelet full of positive compliments from the entire unit. Great to do it quickly before a different embers activity or at another time in the day. Need: Dark room/dark outside, paper, unwrapped crayons. Prep: Unwrap the crayons ahead of time. Directions: Pass out crayons and paper. Have each camper guess what color they are holding (without using light) and have them write the name of the color, and then draw a matching picture. 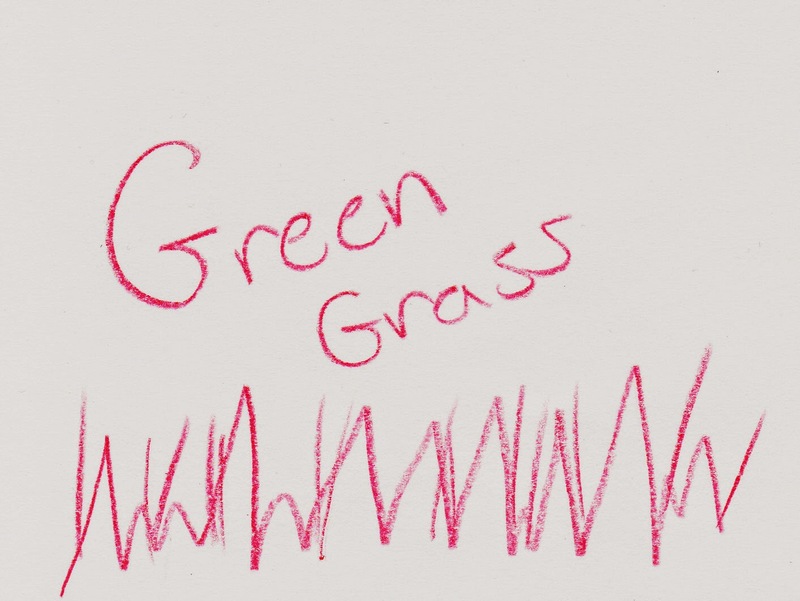 (Green grass, red apple, blue water, etc.). Turn on lights/flashlights. The darkness is a metaphore for the concept of vision not always giving us the full picture even when we can see what is in front of us. Discuss (judging other, ourselves). Certain ones I've never had to change, such as black, brown, green, dark brown, red, orange, yellow, blue, light blue, glow in the dark. 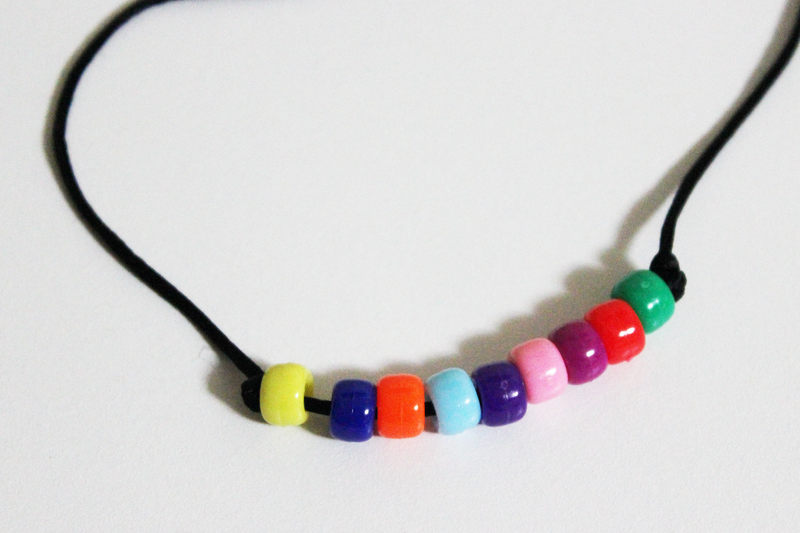 Personally, this is my favorite type of bear scare bracelet as it reflects the campers and the specific session they participated in. I originally searched for more information on these on the internet but have never found anything like mine. I have, however, come across several other neat explanations. Like many things at camp, they like to vary from one camp to the next. Two campers were walking in the woods. They became separated and one camper comes across a bear. She is scared and doesn't know what to do. The other camper, realizing they have been separated, goes to find her friend and scares away the bear. The bracelet represents this tale with knots. There are three knots, the middle one is the 'bear' and the knots on either side are your 'friends'. When you tie the bracelet on your wrist the knot made is 'you'. This is a reminder that whatever your 'bear' is (homework, parents, challenges, etc. ), your friends are always there between you and the bear. This next version uses the same story as above, but without the beads. Usually made out of leather, as the bracelet is worn the leather stretches and the knots 'travel' around the bracelet running away from the 'bear' in the middle. For those like me who have searched the internet for information about these, hopefully this post will help you. For those who have never heard of it, I hope it inspires you to use this with your girls on your next camping adventure. Check out my Bear Scare printable page here! Need: Slips of paper (3 per camper), pens/pencils, campfire (trashcan can be substituted). Directions: GIve each camper 3 slips of paper. On each have them write down something they consider to be a judgement, tell them to write 2 negative and 1 positive (e.g., selfish, ugly, friendly). When they are done have them put them face down in a pile. Shuffle all slips together and turn them over for all to see. 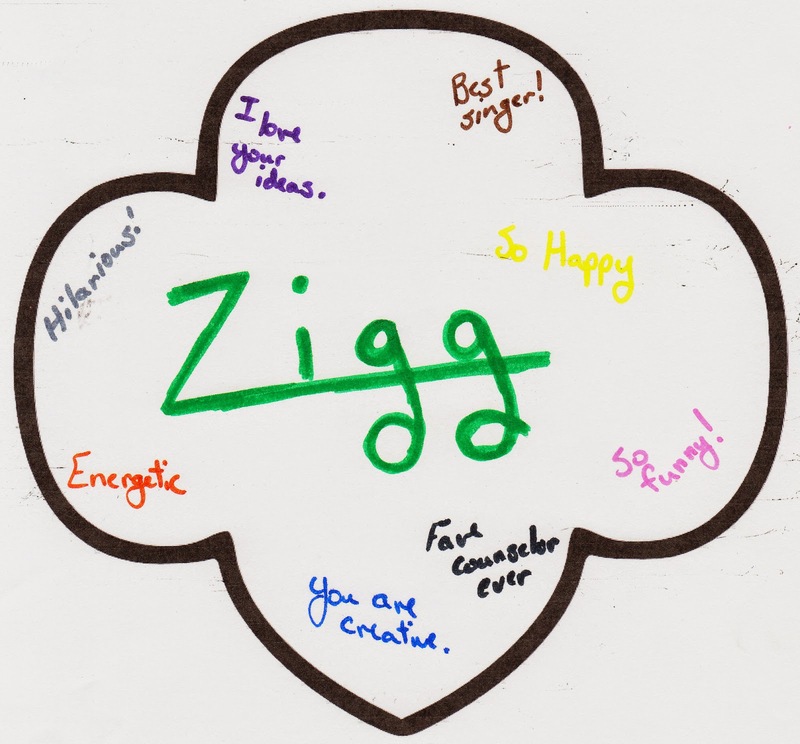 Ask campers to pick 2 judgments they think describe them. Have them explain their reasons. It is likely that the nicest and worst judgments are left. Ask each camper to pick 1 more, 1 at a time. As they pick it up they can explain how they feel to be labeled as such. Talk about how judgments affect people and how we don't always have a choice over how we are judged. Burn judgments all at once in the campfire and let them go. Discuss symbolism of releasing the fear of judgment and moving on. I've always loved viewing the constellations at night at summer camp. It was always the best place to view them without as much light pollution as you see in towns or the city. Through the years I've used many different charts, some harder to read than others. I decided that I needed an easy to read one that can help me out at camp in the evenings. This chart is set for the northern hemisphere at about 10 o'clock (daylight savings time) for the summer months of June and July (but can be used a little before and a little after). In my printable I've also included the (short) Greek mythology stories about the different constellations seen here which include: Ursa Major, Ursa Minor, Bootes, Hercules, Draco, Corona Borealis, Lyra, Cygnus, Serpens, Ophiuchus, Aquila, Scorpius, Libra, Virgo, Hydra, Corvus, Crater, Coma Berenices, Leo, Leo Minor, Canes Venatici, Cancer, Lynx, Camelopardalis, Cassiopeia, Cepheus, Lacerta, Sagitta, Delphinus, Scutum, Lupus, and Centaurus. 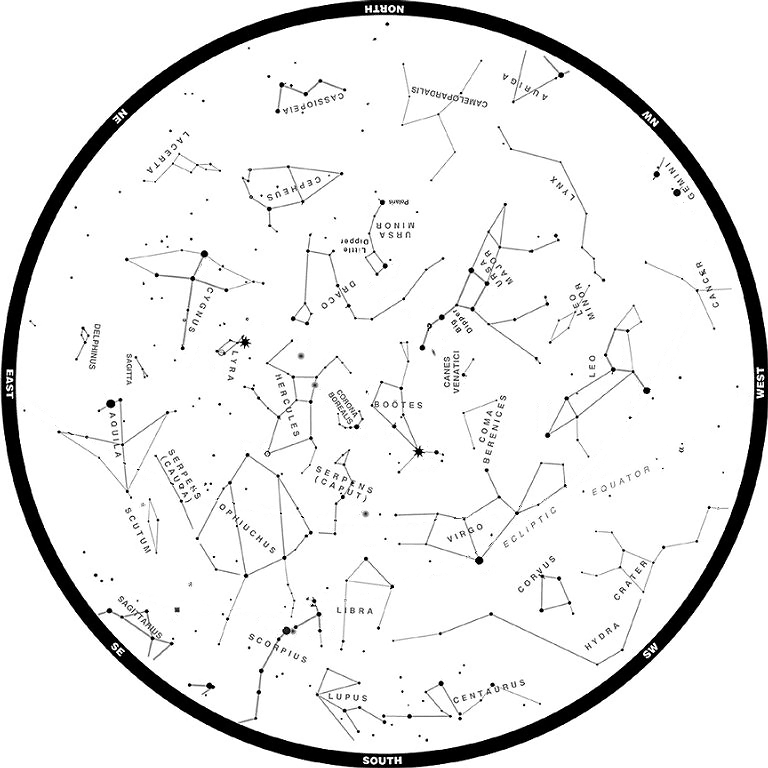 Click here to find my Summer Constellation Chart and Legends printable pages. Want to find satellites in the sky too? http://in-the-sky.org/ is a great website to use to find satellites in the sky and even the International Space Station. NASA has taken beautiful images through the years and you can find them here. Enjoy the view! Have campers create their own star chart and legend. Have campers draw stars (or use stickers) onto a piece of paper randomly. Have them connect the stars how they want (not all stars have to be used) and write their own legend about the new constellation they made. You can find online when to watch meteor showers. Create a Scouts Own to do at night about the night sky. Include songs, poems, stories, and drawings about stars and other things in the night sky. Put on a play about life on a space station. Find other stories about the night sky from different cultures including Asian, Native American, or Middle Eastern. Read books based on Native American legends. This one or this one. Star Letters - Address an envelope to yourself or a friend including your solar system and galaxy address. Draw a stamp on your envelope in a space theme. Write a letter and include a map to your favorite planet. Find stars of different colors. A stars color depends on its temperature. Blue-white is the hottest, followed by, in descending order, white, yellow (like the sun), orange, and red. You won't see a strong color difference. 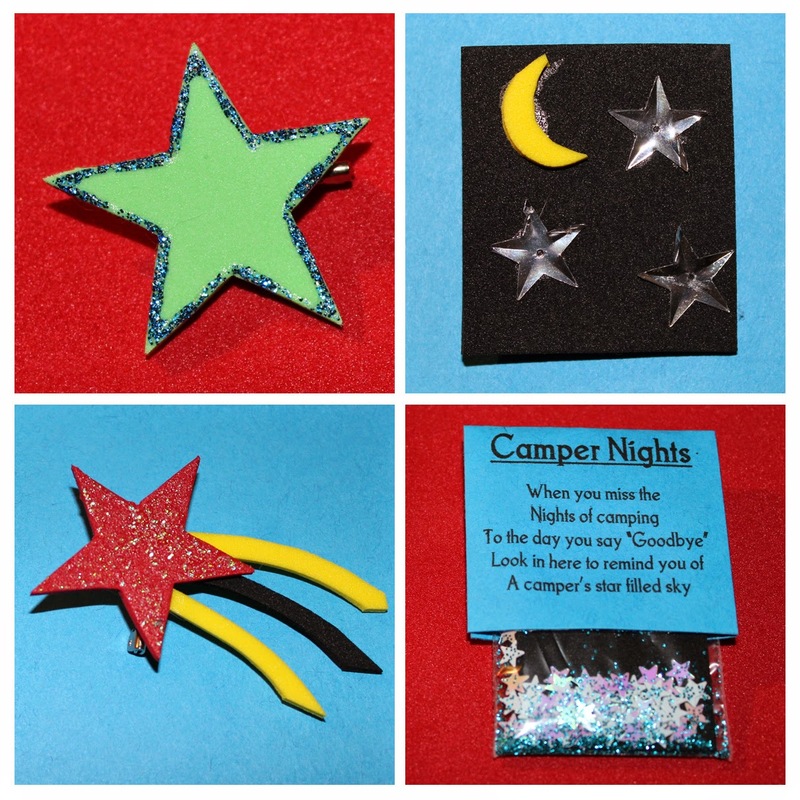 Read a star themed book to the campers and follow up with a star themed craft. Salt Dough stars are easy to make, last a long time, and are cute decorations. 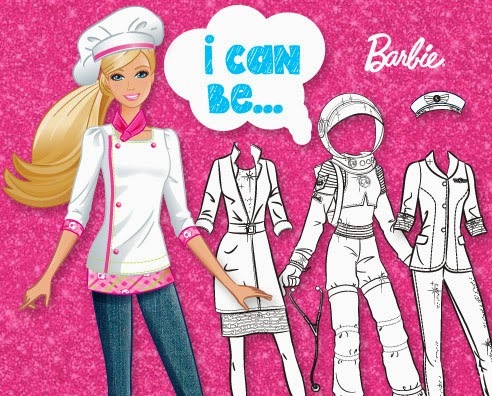 How about an astronaut paper doll? Make a star stuffie with felt. Add ribbon to make a shooting star. Five popsicle sticks make a star. Decorate with paint, glitter, and gems. 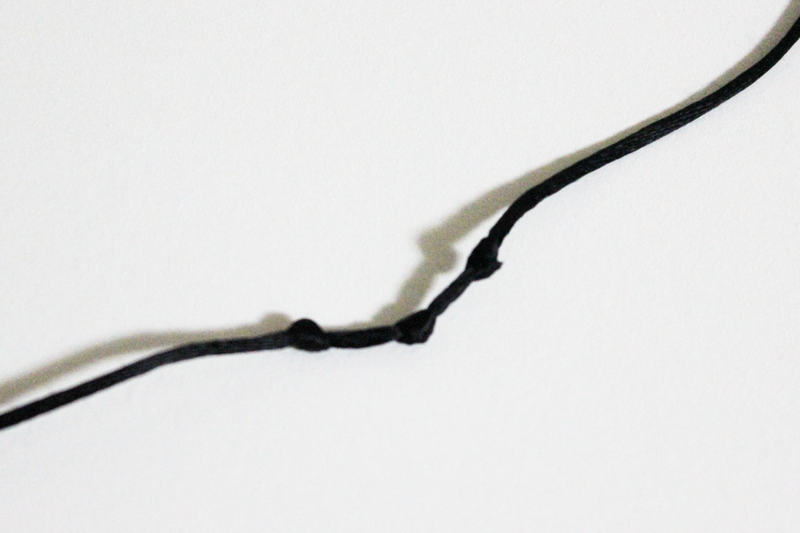 Five sticks also make a star, use wire, string, or grass to tie together for a nature craft. Star shaped melted bead sun catchers are great anytime and can even be patriotic in the summer. Grant wishes with your own wand complete with a star at the end. See stars in the day with star sun catchers made with contact paper and tissue paper. Use up scrap paper by making origami paper stars. Wish bracelets are an adorable memory keepsake. Make some star themed swaps. These can be made from colored paper, fun foam, glitter, glitter glue, or sequins. Want a printable of these activity ideas? You can find them here. This is the second name necklace I ever received. A camper made it for me when I was a CIT and if you notice, the 'I' isn't really an 'I' but instead a broken 'J'. It's in my favorite color, orange, and the beads in between are glow in the dark. 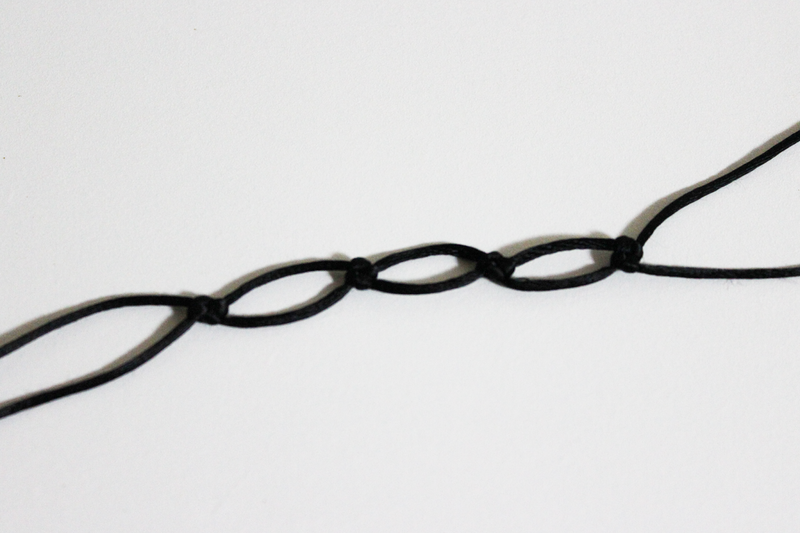 This is a simple necklace but I do have to watch out, it can easily get tangled! I hope these inspire you to make your own awesome name necklaces. Need: The book 'The Rainbow Fish', fish coloring pictures (one for each camper), glue, color items (tissue paper, sequins, colored paper, etc. but enough that they can share with everyone else). Prep: Print the coloring pages ahead of time. Directions: Read the book 'The Rainbow Fish' to the campers. Discuss how sharing makes us feel good. Pass out fish pictures and color items giving each camper only one color (such as 15 blue sequins for one, red for another). Have them share so everyone has one of all the colors. 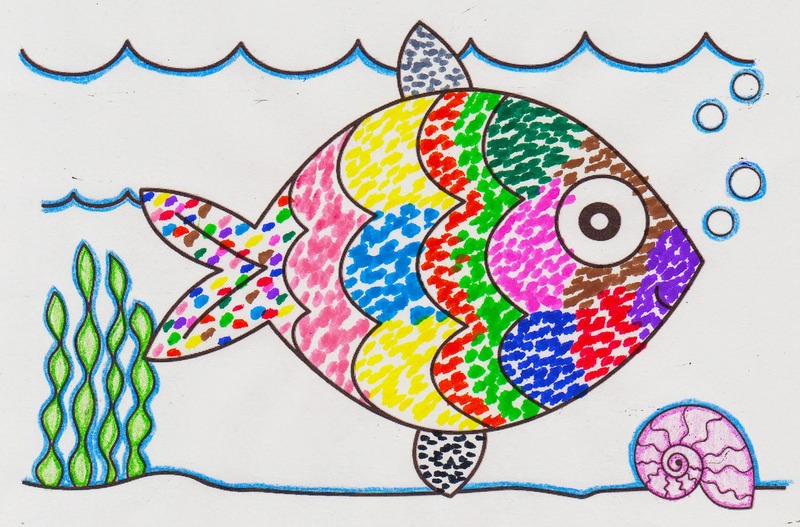 Create a rainbow fish using the colored items they have shared.